In just a few years, Francis Simisim has taken Blue Water Day Spa to a level of prominence in the increasingly crowded local spa industry. From a lone branch along Annapolis Street in Greenhills, San Juan City, he has expanded the business to seven outlets through the company\\\'s own investment and franchising efforts--and he says Blue Water is unlikely to stop growing, even with today\\\'s tougher economic times. "As a joke, I would say people are too stressed thinking about their personal problems to even worry about an economic crisis, so they\\\'d rather spend their time here in our spa," says Simisim who manages a business that was put up in 2005 by his massage-loving parents, metals trader Wendell Samisim and beauty maven Mary Simisim. To the young Simisim, though, running "the metro\\\'s hub for soulful wellness"--as the company describes itself in its marketing slogan--and attracting more clients in a slow-moving economy is always serious business. Over the last nine months, the young Simisim has been kept busy overseeing the construction and recent soft opening of Blue Water\\\'s newest outlet on Ortigas Avenue, also located in Greenhills, and sealing deals with franchisees to put up two more branches--one a soon-to-be-opened "spa retreat hotel" in Tagaytay City in Cavite; and the other a spa within the Capitol Hills Golf Club premises in Quezon City. Both spas, he says, are the first of their kind in the country. Even the company-owned Ortigas branch is unique, Simisim says. 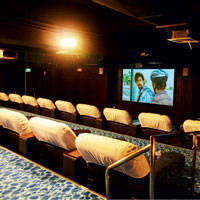 This is because it literally has a "spa theater"--a 29-seat movie house where clients can enjoy the full range of Blue Water\\\'s treatments while watching their favorite movies. The theater is the core of the branch\\\'s 621 sq m space, which can accommodate 52 clients at a time. He says that like all of its sister outlets, the Ortigas branch offers the full range of Blue Water\\\'s services: body massages, body scrubs, hand and foot treatments, facial treatments, and face and body machine treatments. This range of services includes Blue Water\\\'s signature treatment--the Tibetan meridian fire therapy, a relaxing and painless procedure guaranteed to trim inches off a targeted area of the client\\\'s body. "We\\\'re the only spa in the country that offers this." Simisim says. Since the soft opening of Blue Water\\\'s Ortigas branch last January 2009, its highly accessible location and expansive area have been a strong attraction to families and groups of friends from across the metropolis. Blue Water has been aggressively pushing its group packages and offering its theater as a small-events venue. A common thread that binds the Simisims and their business partners is "the passion for wellness and beauty," says Francis, whose family had owned a branch of the Clara International chain of beauty centers before opening Blue Water. "I think that this passion is the key element in investing in a spa," he adds. Simisim says he has decided to "stay local" when it comes to the day spa\\\'s manpower requirements. Although the company hires foreign consultants to improve its signature treatments that come from around the world, he believes that Filipinos have more "hospitality skills, service-type skills"--which he says is what helps distinguish Blue Water from other spas here and abroad. He adds that while Blue Water is "more into technologies" with its treatments, it also offers the traditional Filipino ways of massaging and healing. This is so that "this generation" can learn about them and appreciate their value to people\\\'s health and well-being, he explains.